Many would look across the ocean at night and feel a tinge of fear. I guess that is normal—fear of the unknown, fear of the dark, fear that something out there is coming to get you. But for those that have embarked on diving in the open ocean at night, it can bring on a feeling of curiosity, excitement and discovery. Larval tonguefish photo taken during black water dive. Photo by Mike Bartick. The term “blue water diving,” coined by William Hammer and company, happened as a need for effective research. While attempting to study planktons, they discovered that the fine mesh nets they were using to collect them were actually destroying some of them. Curiosity drove them to dive down to observe and record them in their natural habitat—open ocean. David Attenborough eloquently describes the movement of planktons as the “greatest migration of animals on the planet that happens every night, just offshore”. Millions of planktons migrate vertically from the depths. They disperse, feed and then return to the depths, all under the cover of darkness, when most filter-feeding marine mammals are resting. The term “black water diving” was coined by a Japanese award-winning photographer named Ryo Minemuzo. 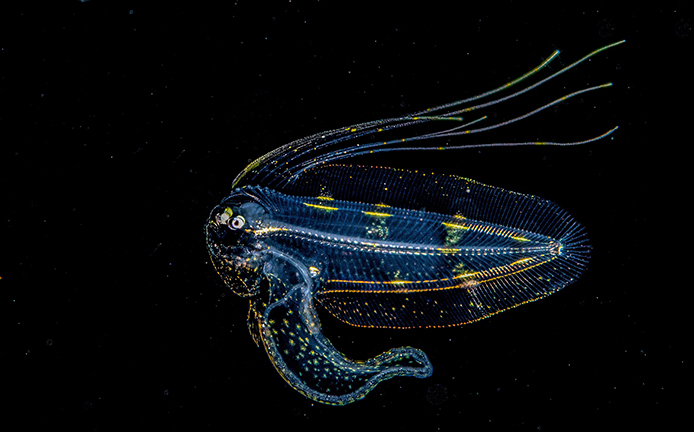 His stunning images were actually captured by placing as many as 20 torches into the sand, facing upwards at night, which in turn, attracted inshore planktons and the subjects that feed on them. We now call this method “bonfire,” which is conducted in the shallow waters over sand or rubble and near, or over, a reef. 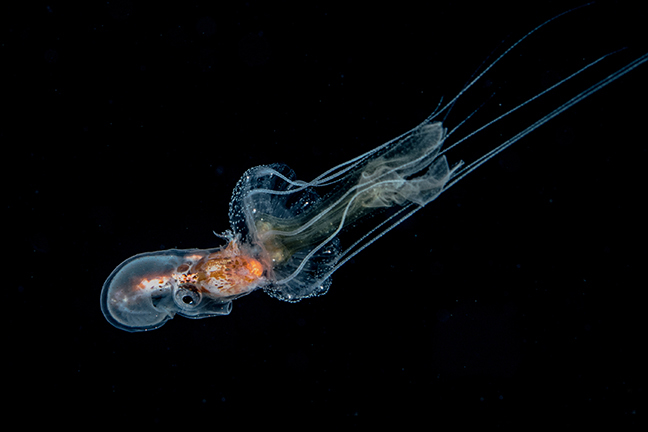 While bonfire diving is a great way to study larval subjects in the shallow waters, the real black water experience only happens in open ocean. For the real black water diving experience, open ocean is your destination, over very deep water, away from any reefs and the sea bottom. The differences between these two habitats are quite significant, and both are just as interesting, fun and as surprising as the other. In fact, you are most assured to say, “What is that thing?” repeatedly, both on the dive and while processing your images in post. My first experiences began much like the scientists above, when a group of friends in the United States invited me along to join them in hopes of photographing jellyfish off the Southern California coastline. The continental shelf approaches the coast near Dana Point, approximately five miles from shore where the substrate drops off to abysmal depths. 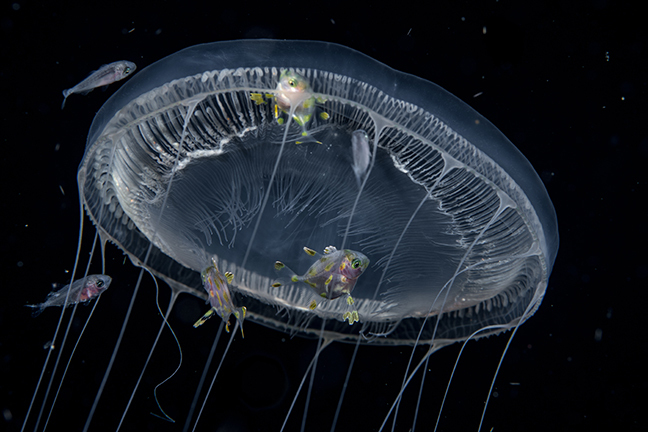 Here, the currents push up and bring with them giant salp chains, comb jelly and a myriad of other horizontal drifters. A few years later and after seeing a friend’s images of black water subjects, my interest churned again, which compelled me to get out there and see it for myself. I have always been curious by nature, and this next step seemed like the most logical one for me, jumping into the open ocean at night. There are several ways to get set up for a safe black water experience. Some divers prefer to tether themselves to a downline while others, like myself, prefer the freedom of not being tethered at all. As one could imagine, this style of diving has an inherent exposure to danger, so a few precautions should be taken to mitigate it. It is not what is in the water that poses the real danger—the real danger in black water diving is complacency. In the beginning, our dive team would simply tie off a rope with a light on it to the balancer of our banca boat. More than once the surface wind picked up, and the boat began dragging the line faster than we could kick. Watching a line that is attached to a boat while drifting and searching for small subjects in open ocean at night, does not exactly make for a relaxing experience. After some time of doing this and many more black water dives under the belt, our system has been improved to create a safer and more conducive dive experience. The latest version of our rig has a lit buoy attached to the top of our 30m downline. Our downline is equipped with video lights pushing 35,000 lumens of inviting warmth out into the dark night waters. The buoy line drifts free from the boat, with the current, this style of black water diving is like being suspended in space with nothing moving around you. The boat follows closely behind as we drift, sometimes several kilometers on a single dive, without even knowing it. This technique is by far the best method we have used so far. A couple of things that I like the most about black water diving is that it is impossible to set up a shot. There is just no way to stop something or to get a second chance if you missed it the first time. It is all about hunting, drifting and shooting your subject as best as you possibly can at that moment. The other thing I like and probably the most, is the opportunity to see something that is truly unique. Discuss a bail-out plan or measures to take if a diver should drift out of sight from the line. Do an emergency recall from the boat. Limit the amount of people to small groups. Never let your ego, or anyone else’s, override common sense. Your diving technique is almost as critical as your shooting technique while drifting and will take some practice. The more times you do this style of diving, the better you will become at both recognizing subjects and how to approach them. Give yourself three or four attempts before the magic begins to happen. In this new black world, transparency rules the night. As you drift along, your torch will become your best friend for finding and tracking your subjects. Slowly move around with the current and search for your subject. Once a subject is spotted, advance slowly. Try to use its momentum in your favor. Remember that your personal pressure wave can cause the delicate little drifters to close up or get spooked. Try to let them come to you and use as little movement as possible. The idea is to find a subject and calmly drift along with it and photograph it as best as you can. Being quick on the shutter release and timing your shot are important. Keep your eye in the viewfinder, and your head in the game. Bali. I recently indoctrinated several new divers to black water diving while hosting a work-shop on Bali in Indonesia. Black water diving was just a side dish to the workshop, but it quickly became the hot topic and everyone wanted to join. I am certain we were the first in that area, if not the entire island, to do black water diving, and it was well worth it. We ventured out into the open ocean from the Mimpi Channel until it felt deep. Judging by the proximity to a local island and, of course, the local knowledge of the dive guides and boatmen. The dive started out well and finished even better, with many unique finds and many happy divers. In fact, the chattering on the boat after the dive was a stark contrast to how it sounded on the way out to do the dive. Nerves were a bit tense amongst the newbies as the boat puttered out further and further. Philippines. In my dive courses at Anilao, Philippines, we do a lot of black water dives using a map of the depths of the local bay and channel. This helps us to figure out the best places to jump in and for what reasons. I can say, confidently, where we can find one kind of subject like jellyfish versus subjects like fish larvae, but the truth of the matter is, one cannot really predict what will be seen. 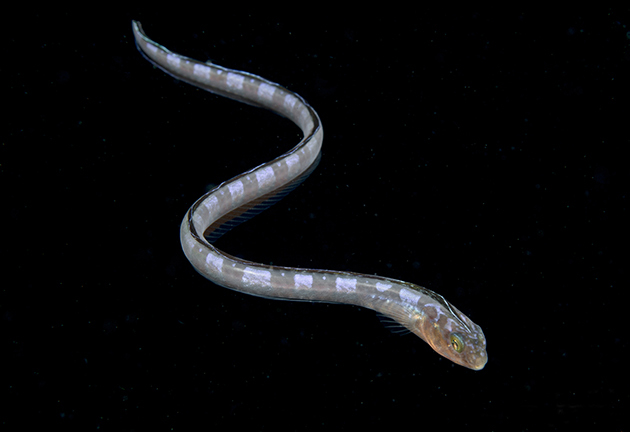 Another way to attract planktons can be done on any night dive. Simply use a torch that is at least 2,000 lumens positioned in the sand and facing deeper water. We call this style “bonfire” diving. This style is more inclusive of divers learning buoyancy, or those that are not comfortable with open water diving. I use two or three torches but have had just as much luck with a single torch. I have even dangled a light from a boat over deeper water, while tied off to a mooring ball. There really are many ways to experiment, and again, there is no way to tell what will show up. United States. Black water diving is gaining popularity and in many different areas, making it possible to plan for it as a part of your next dive trip. The dive operations in Kona, in the US state of Hawaii, have been doing this for many years and are probably the first operations to do it commercially, when they introduced the “Pelagic Magic” experience. Funny as this seems, with all of my diving in Hawaii, I have not done it there yet. Another really active US location is West Palm Beach, Florida. Approximately five miles from the coast, the gulf stream approaches the shoreline, and the locals have been finding some very special subjects. The dive operations offer black water diving several times a week, and you will most certainly have several locals on the boat to help with any questions. Be ready for the shot by gearing up properly. The best lens for an Advanced Photo System type-C (APS-C) framed SLR is hands down the 60mm lens. I have used the 105 but ended up missing several great opportunities. For full-frame (FF) camera rigs, I suggest the Nikon in DX mode and a 60mm lens, or for Canon FF, a 50mm macro lens. Strobe position is important too, and water clarity must be judged often to determine the best ways to light your subject. Remember the subjects are small, for the most part, palm-sized at best, barring the occasional squadron of squids that might come in to investigate. For the close work, my strobes are usually turned in, facing the 8 and 4 o’clock positions on the opposing strobes. For shooting further away, I will swing my strobes back to an outward position. Backscatter is a big issue for black water diving, but it is not such a bad thing. Open water is the habitat of the subjects we are shooting, and as long as the backscatter is not critical, then do not worry about it. Just try to limit the amount of backscatter in the frame, think fast and work those strobes. Anilao is set on a peninsula with two bays, one on either side. My team of divers has been exploring the depths now for a couple of years. Recently, we have acquired a map of the sea floor, which has helped us to determine the areas to target. Drifting in the “deep end of the Verde Island Pass” has been a long-time goal of mine. With the construction of our new downline, we plan to do a lot more of it. Black water diving is an exciting way to add a new dimension to your portfolio, guaranteed to re-ignite your curiosity for the ocean. Once accomplished, you will soon find yourself counting down the hours of daylight before getting out to do it again. 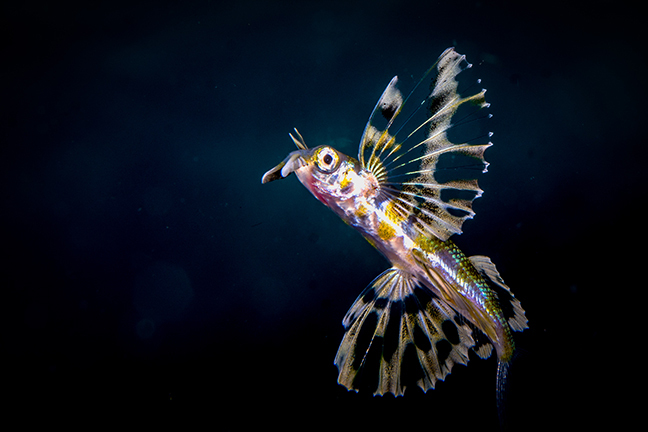 Mike Bartick is a widely published underwater photographer and dive writer based in Anilao, Philippines. A small animal expert, he leads groups of photographers into Asia’s underwater realm to seek out that special critter. 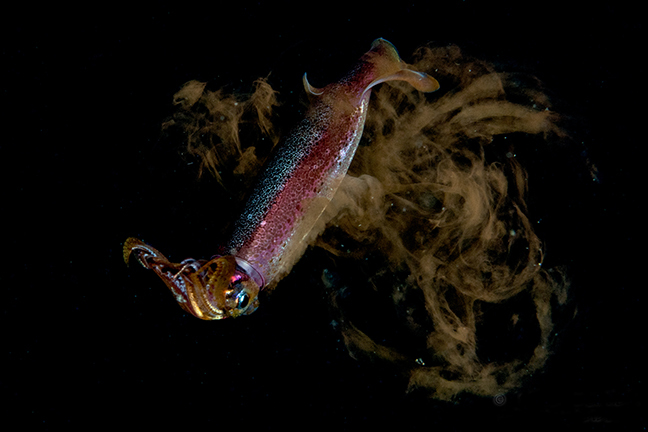 For more information, visit: Saltwaterphoto.com.